I haven't had a lot of tatting time this week, but when I have had time, I've been working on stars from Kaye B. Judt's Oh My Stars! My latest effort is the blue and green "Two-Color Star." I used Flora and Lizbeth, which don't seem exactly the same size to me, even though they're both size 20. I really like the way this one turned out! Aren't they fabulous? These are the bookmarks I received in the bookmark exchange at The Tatting Forums. The deep red bookmark is from SpiffyMz and the dragonfly bookmark is from madtatter80. I am very impressed with these two works of art. I hope they like the bookmarks I sent in exchange! Getting ready for a celebration! 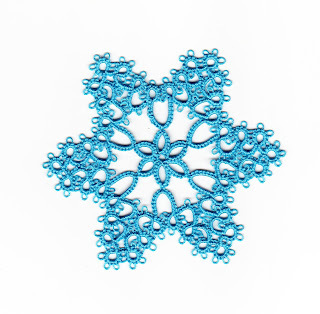 We're getting close to 500 members at The Tatting Forums, and I decided that in celebration I'd tat up some stars! This one is my favorite from Kaye B. Judt's Oh My Stars! This is a great little book, and it teaches some wonderful techniques in very simple motifs. I haven't mastered all of them, in fact I haven't tried all of them! I guess I'll have to see how many I can make out of what's left of my Juicy Watermelon. After that, I'll have to decide how I'll use my stars... decorate a denim bag, a t-shirt, a scarf, a quilt top? How would you use your stars? 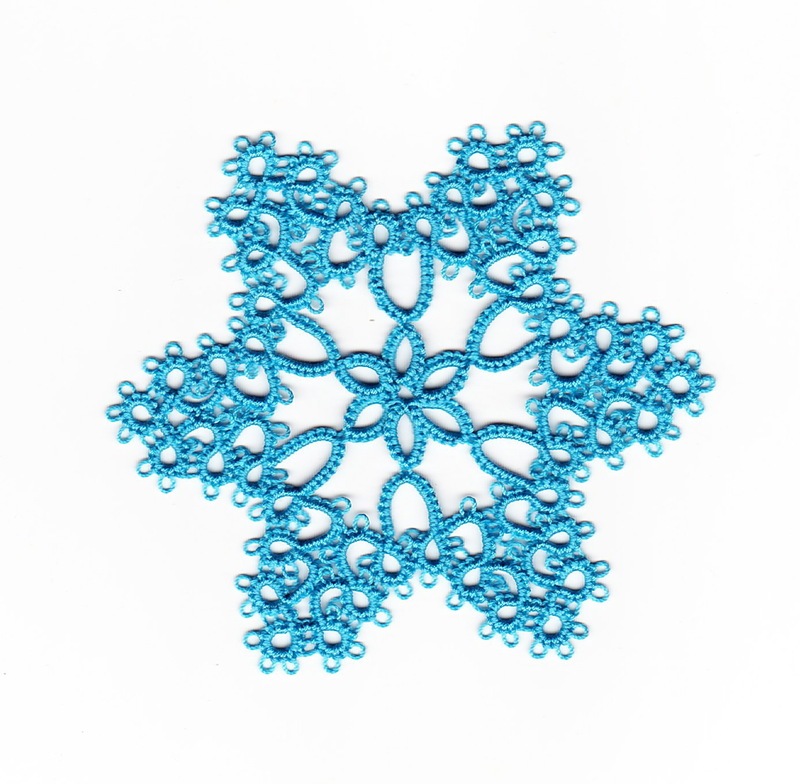 I participate in the One Snowflake A Month Challenge at The Tatting Forums, and I've been feeling the end of April closing in quickly! This is Motif #7 from DMC Tatting for Today. The thread is size 20 Lizbeth, color #662. I'd be willing to bet that the casual observer would never notice that I missed a join, which I didn't discover until I had finished hiding my ends. Rather than scrap the whole piece, I took a piece of thread, joined the two picots, and sewed the ends in. I'm sure there's someone out there in Tat-land who can find where I did this, but my solution was good enough for me! And now, back to my hanky edging! I finished attaching my Forget-me-not edging yesterday, and I love the way my hanky turned out! The pattern is from A Pattern Book of Tatting by Mary Konior. The thread is size 20 Lizbeth, Juicy Watermelon, color #156. The hanky is from a discount story near my mom's called Burke's. I meant to order size 40 thread, because I thought it would look nice with the hanky. Still, I have no complaints! I'm still working on the hanky I started months ago. It's taking me a long time, because the pattern just isn't holding my interest. I think I chose one that's just too simple. The pattern is Handkerchief edging #1 from The Craft of Tatting by Bessie M. Attenborough. The thread is size 80 Lizbeth, Marble, #121. The shuttle is from The Shuttle Shop, tatting by AnneB, acrylic shuttle by Chris Hinton. I'm so glad to have this shuttle. It holds a ton of thread! I'm going to continue working on my hankies, but I'm getting the urge to work on something quick... perhaps a snowflake! Oh, yes! I did have fun! Denise and I left at 7:30 a.m. to attend the Lafayette Lacers' Lace Day, and we had more fun than two girls should have in one day! It took us a little longer to get there than we anticipated because of the torrential rain we had to drive through. We didn't mind the rain, though. After all, how much gardening/fishing can one accomplish in the rain? We entered through the wrong door, but still managed to find the registration table, where we each purchased a commemorative bobbin, and chose a divider pin for our bobbin lace. 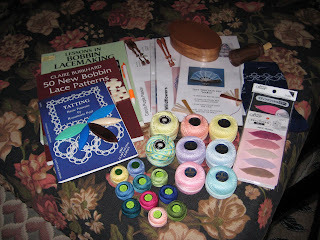 Yes, I'm doing my best to get Denise addicted to bobbin lace! Unfortunately, the book I recommended to her was not available at this show. Don't worry... we'll track it down! The first person we recognized was Battatter! We saw her, and she saw us from across the room. Smiles, waves, and hugs quickly ensued! We actually got to see the bats up close. Naturally, I forgot to take a picture. I'm really not much of a picture person, and despite the fact that I carry my camera with me almost everywhere, I hardly ever remember to take pictures! Did you see those pretty little blue and red Clover shuttles above? I mentioned on my blog that I would love to have blue and red shuttles, and dear, sweet Carolyn surprised me with them! Her wonderful, thoughtful gift completely made my day! Thank you, Carolyn! Carolyn also had a wonderful display showing the comparison of motifs tatted with different size threads and wire. Can you imagine tatting with wire? Her pieces were fabulous! I don't know if you can her earrings in the picture, but they are wire. Some day I'm going to take Carolyn's class on tatting with wire. Seeing the actual pieces just made fingers itch for tatting! Again, I forgot to take a picture... sorry! While Denise and I were shopping, we ran into The Tatting Goddess! Yes, we really did, but again I forgot to take a picture. You'll just have to take my word for it! Gina brought along many of the pieces she's been blogging about. The photos are great, but the actual pieces are amazing! I really think I need to start a sample book of some kind. It was so much fun to see the patterns and the pieces in one place, and to get a personal explanation of the entire process! I even got to meet her friend and thread-dyeing buddy, Sally. After hearing how addictive thread dyeing can be, I think I'd better steer clear of experimenting with dyes! While Gina, Sally, and I were chatting, a call came out for someone to show some tatting in progress. I'm not sure if I jumped the gun, or if no one else responded, but I quickly ran over to show off my Forget-me-not edging. The ladies who wanted to see tatting demonstrated were Japanese, and did not speak much English. They asked to take photographs, and I said yes... how flattering that someone wanted to take pictures of my tatting! I told them they could find tatting tutorials on YouTube, and I showed them the packages of Clover shuttles I had just purchased. I think they were excited to see that the shuttles were made in Japan! I just happened to have some of my blinged shuttles with me, so I offered each of the ladies a shuttle. They seemed very pleased. Could it be that there are three new tatters in our future? I hope so! For those of you interested in trying the edging I made for my sister, I just found it in The Tatter's Treasure Chest on page 79! So, the pattern is readily available! I'm off to Lafayette! Happy tatting! I've finished my third bookmark, and now I'm ready for the bookmark exchange at The Tatting Forums! I'm not sure how many exchange partners I'll have, but I decided to be prepared for three. The pattern is from Emsyjane. The thread is Altin Basak, size 50, color #3001. Look what I did with my Mentos container! Karrieann sent me the loveliest Christmas package of tatting goodies, and she included a container of Mentos gum. I like gum, but I don't chew it very often. So, it took me until now to finish it! Karrieann suggested that the Mentos container be used as a thread holder. I didn't want to be a walking advertisement for gum, so I blinged the container. I think it turned out cute! I won't be making any more, though. First of all, it would take me ages to chew that much gum. 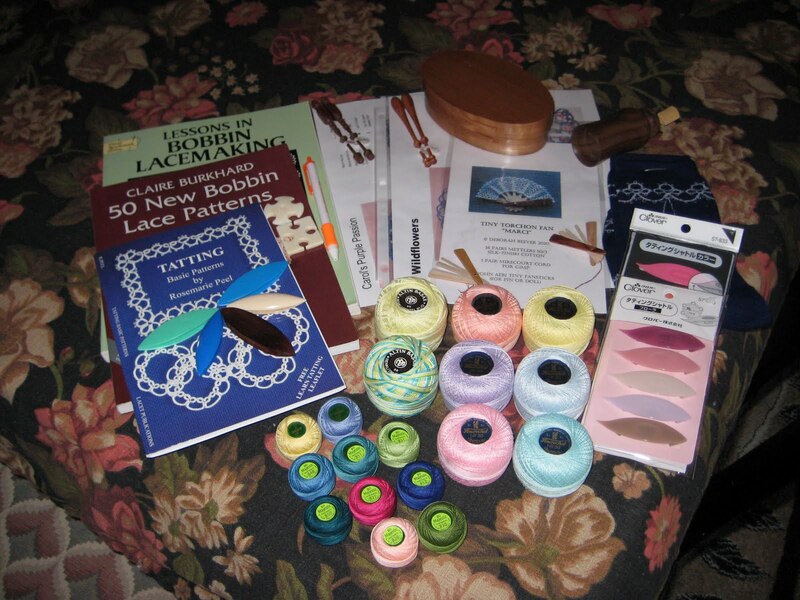 Secondly, I'm trying (unsuccessfully) to whittle down my tatting supplies. I certainly don't need to accumulate any more containers, but this one I will keep. Thanks for the idea, Karrieann! #13 - Frivole! Please send me your mailing info at DianeCademartori at gmail dot com, and I'll get your shuttle out to you as soon as possible. Oh, and please let me which one of the three you'd like to have! Thank you, everyone, for entering my little drawings. It means a lot to me that so many people read my blog, leave comments, and are interested in receiving the goodies that I offer. Maybe I'll give away another shuttle next month! I really, really, really like this pattern! This time I used size 20 Lizbeth, Tropical Fruit #107. The combination of pattern and thread makes such a cheery bookmark! Thank you for providing such a pretty and easy-to-do pattern, Emma! 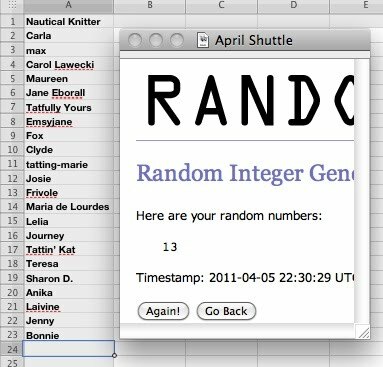 Another shuttle giveaway, that is! The winner may choose one of these three shuttles. Denise and I will each keep one of the other two. I meant to post this on International Tatting Day, but somehow the day got away from me, and yesterday I was off to the Sewing and Quilting Expo... what fun! I'll draw the winner's name sometime during the week. Just leave a comment on this post, and your name will be entered into the drawing! My friend Chris at the post office and I think that someone tried to run it through a machine. Obviously, the thickness of the package was not a concern! Luckily, I had an envelope with Marie's name inside the package. Otherwise, I'd never have remembered who I was mailing it to. Marie's package is safely on its way again... in a box! The pattern is from Emsyjane, simple and easy to follow. My tassel is about half the thickness that the pattern calls for. I have a terrible time with tassels, and I just couldn't make it look as pretty as the pattern picture. Of course I used one of my new Emsyjane shuttles! Oops... I forgot to take a picture of it. I guess you'll just have to go to the shop to see the little beauties that Emma has to offer! The thread is Hakelgarn Nr. 20. I love this thread! I now have three hanky edgings in progress. I love having multiple projects. That way I can flit from one pretty pattern and thread to another! It does make it difficult to finish anything in a timely manner, though. Next week... Lafayette Lace Days! I can hardly wait!